At least 34 people have died, and up to 300 are missing after a dam collapsed at an iron mine in Brazil on Jan. 26, 2019. CNN reported that the dam flooded in the southeastern state of Minas Gerais. A spokesman for the local government identified the company that operates the dam as the Vale Mining Company, the largest mining company in Brazil. The employees of the company were eating lunch when the 280-f00t dam burst, sweeping away animals, residents, and the workers. Over 260 Vale employees have been reported missing. Authorities say 429 workers were in the mine at the time of the dam burst. Sargent Acquiles, a spokesman for the civil defense agency, told CNN approximately 279 people were rescued. He expected 200 rescuers would be on the scene of the disaster by Saturday. A spokesperson for the Minas Gerais fire department said as of Saturday 34 bodies have been recovered, and 23 people had been found alive and taken to local hospitals. They also reported 100 workers were found safe, but 296 are still missing. 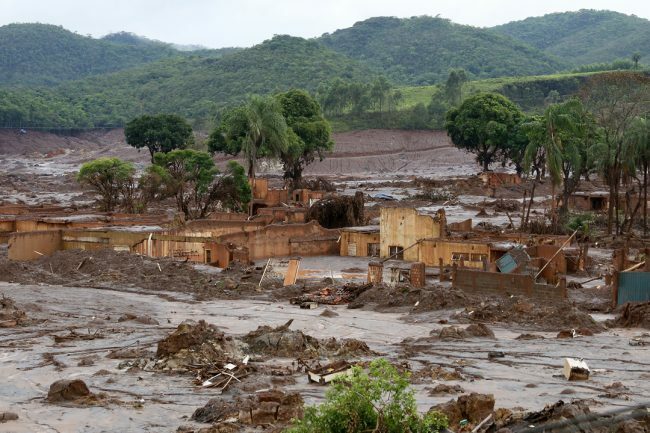 The latest dam incident comes three years after another the collapse of another dam operated by Vale, in what was considered the worst industrial environmental disaster in Brazil’s history. In that catastrophe, which occurred in the town of Mariana, 19 people were killed, close to 400 people lost their homes, and hundreds of thousands of people were left without fresh water. Fábio Schvartsman, Vale’s chief executive officer, said he expected the Jan. 26 disaster would prove to be even more destructive than the 2015 accident. He expected that the majority of those who have lost their lives would be Vale employees, primarily mine workers. The Civil Defense office claimed emergency workers rescued 200 people, but only 22 have been identified. Their names are listed on the walls of the crisis center. The Brazilian government has imposed a $200 million fine on Vale and froze the company’s accounts of approximately $1.3 billion to compensate pay for the damage and remove debris. The company was given 48 hours to develop a plan to compensate the victim’s families for their loses. The President of Brazil, Jair Bolsonaro is a far-right leader who took office on Jan. 1. Part of his campaign promise was to cut back enforcement of environmental regulations and mocked environmental regulations and safeguards. He also called for an end to environment fines and wanted to open up protected lands to miners. At a news conference on Friday, Schvartsman said he was worried there would be a large number of victims, most of whom would be miners. He also said the Brumadinho mine had been inactive for three years and had passed an independent safety and environmental inspection as recently as December 2018. According to Brazil’s water agency, the country is in a fiscal crisis, and inspection of dams has fallen 16 percent. The agency says 723 dams across Brazil may have structural problems. 11 Responses to "Brumadinho Dam Collapses 34 Dead Up to 300 Missing"